I never used to be a big fan of afternoon tea but lately I am a complete convert. There is something so cosy about an afternoon tea at this time of year, enjoyed with friends and good conversation so I was delighted to be invited along with the Bournemouth Bloggers to the launch event for The Bell Inn’s festive NativiTEA. The Bell Inn is situated in the heart of the New Forest, fairly close to Southampton and just a 40 minute drive from Bournemouth. From first impressions, it looks like it might be quite small but it is actually deceptively large with 28 bedrooms, a restaurant, bar and function rooms. It can even be hired out exclusively for weddings, providing a lovely intimate feel for your nuptials. We were greeted by Kimberley, marketing director for The Bell Inn, and shown to a lovely private room where we would be served our afternoon tea. Although the Christmas decorations weren’t yet up, a festive candle was lit and as the food was brought in, it began to feel a lot like Christmas. I don’t really drink hot drinks (yes, I know this kinda goes against the point of an afternoon tea) but Ciara absolutely loved her spiced apple tea and there was a whole selection to choose from as well as coffee. We got to work photographing the food from every conceivable angle (I even took it a step further and got down on the floor to ‘get that shot’) and finally allowed ourselves to sit down and enjoy the delectable savoury and sweet treats on offer. By far my favourite were the Swallowfield Farm sausage rolls, topped with fennel seed and sesame. They were delicious and incredibly moreish. I would have happily sat and eaten an entire plate of them. I also surprised myself with the sandwiches and really enjoyed both the cheese and spiced tomato chutney and turkey and cranberry varieties (I am not a big fan of smoked salmon but heard it was lovely from others). When it came to the cakes, I was blown away by the Chocolate and Chesnut Yule log with hazelnut praline cream. You could tell it was freshly prepared and, although a little messy to eat, it was totally yummy. There was also a tipsy sherry trifle with popping candy sprinkled on the top – how cool! 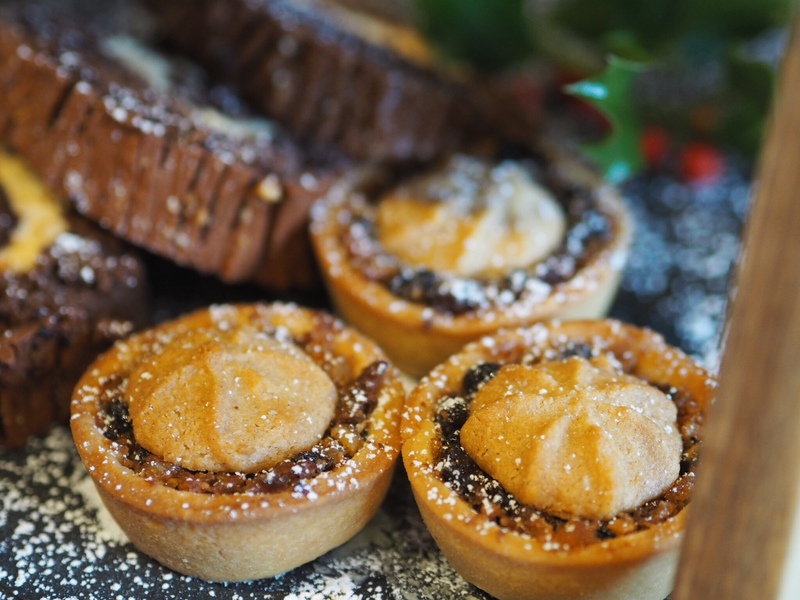 Finally, the homemade mince pies looked almost too good to eat. We were treated with an extra one to take home which Ed really enjoyed, as well as a recipe to recreate them ourselves. Before we left, we were provided with a tour of the venue and given a gift bag with locally produced goodies inside including conker gin and a New Forest Aromatics candle. I had such a nice time and can highly recommend the NativiTEA if you are looking for a festive treat this December. The Bell Inn also offer an extensive range of other afternoon teas, should you wish to try something a little different. I was provided with a complimentary afternoon tea, however I was under no obligation to write a post and all words and images are my own.